Will 2018 be remembered for being the year of the rap beef? Well, no, probably not, arguments between rappers are always bubbling away under the surface and have done almost since the genre emerged. 2018 has given us some entertaining feuds between rappers though, with Drake and Kanye beefing it out recently after Drake allegedly ‘threatened’ Kanye’s family. As well as the whole Drake/Pusha T saga. Is there a theme emerging? 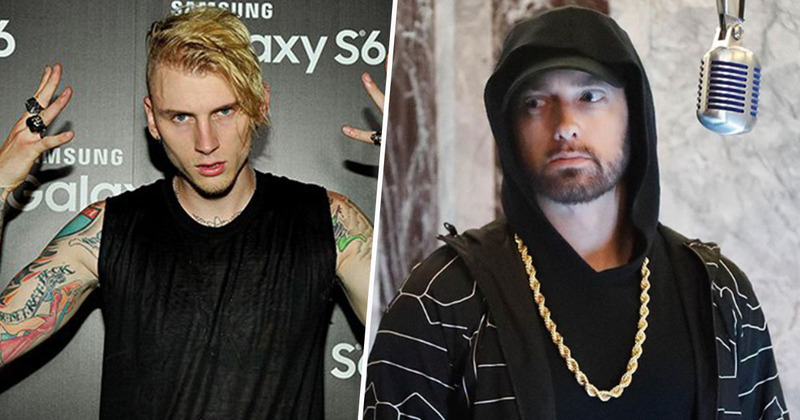 As we count down to midnight and prepare to kick 2018 into touch, however, it seems Machine Gun Kelly doesn’t want us to forget about his beef with Eminem that was relevant for a brief period earlier this year. Trying to make it relevant once again, the Cleveland-born rapper posted a video to Instagram which aimed to dig up the past, as it contained a snippet of his Eminem-dissing track – Rap Devil. just to piss y’all off one more time before the years over… y’all still BIG mad… f*ck rap god im the rap devil… goodbye 2018. In case you needed reminding, the feud between MGK and Slim Shady began way back in 2012 when Kelly tweeted about Slim’s daughter, Hailie, being ‘hot as f*ck.’ MGK also claimed Eminem banned him from appearing on his Shade 45 channel. In August this year, Eminem released his 10th studio album Kamikaze, in which he took aim not just at Machine Gun Kelly but a number of other musicians. This led MGK to mock Slim’s ‘Rap God’ persona with his own track Rap Devil. The beef then continued when Slim released a diss track of his own in response, titled Kill Shot. just to piss y’all off one more time before the years over.